When thinking of ways to use fresh-seasonal fruit, a refreshing summer cocktail is never far from our minds - especially after a day spent picking strawberries from the vine in the agricultural district of Pungo. Our friends at Chesapeake Bay Distillery have the perfect locally-crafted spirits to pair with the fresh muddled strawberries for a tasty drink that is all Virginia Beach. While a typical Moscow Mule combines vodka and ginger beer, this takes it up a notch with the fresh berries and spicy Blue Ridge Ghost Pepper Vodka! Both the ghost pepper infused vodka and traditional vodka can be purchased in local package stores or in the tasting room of the Chesapeake Bay Distillery, in the ViBe Creative District - which is where we recommend trying it. While you’re there, you can try a flight of various creatively-crafted cocktails featuring many of their craft liquors, like a spicy Bloody Mary or a Lemon Drop. Layer all ingredients in the glass of your choice, starting with the muddled fruit. 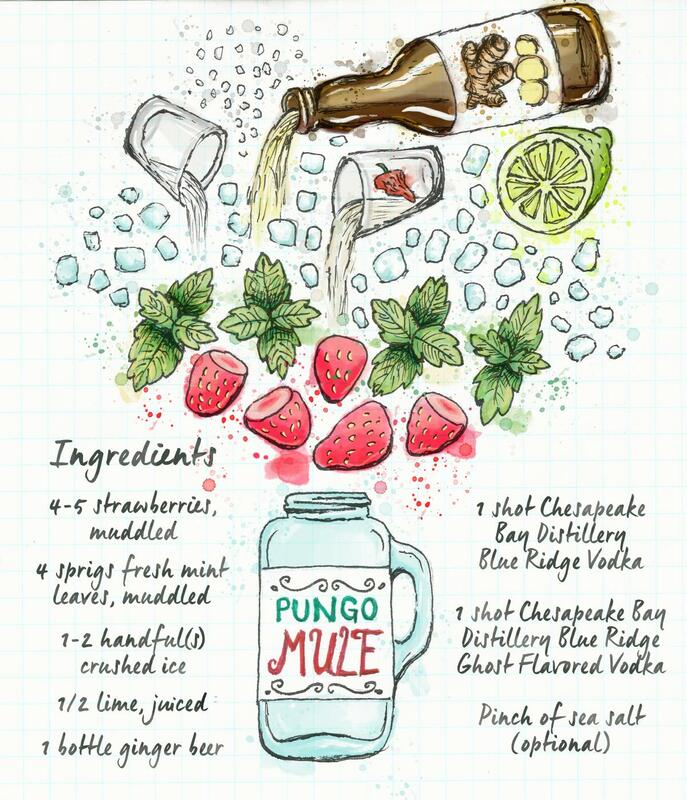 Garnish with a sprig of mint and a Pungo Strawberry on the rim. While strawberry season in Virginia Beach runs from April - June, fresh picked strawberries can be vacuum-sealed and frozen to enjoy delicious local strawberries, and Pungo Mules, any time of year. Cheers!